The Grey Rocks tower above Cerulean Lake. Northern California is teeming with anonymous and unappreciated mountains. Although nearby Mount Shasta may famously be as lone as God, no great peak in the region is as forsaken and lonely as the Grey Rocks. Towering prominently above the surrounding landscape, their dark, brooding mass is glimpsed for a tantalizingly brief moment when traveling south on Interstate 5 from Mount Shasta. Aside from this abrupt vista, the Grey Rocks are only observed from parts of the Castle Creek drainage, from high in the Trinity Divide or the Trinity Alps, or from the slopes of Mount Shasta. The difficulty in observing the Grey Rocks is only surpassed by the challenge of accessing them. No trails lead into the massive complex of peaks and the only roads in the area are generally poor and seldom used. Access is further complicated by the presence of immense brush fields that block off the most obvious approach routes to all but the most self-punishingly motivated. What these impediments have obscured is one of the most breathtaking mountain landscapes in the California Northstate. All the ingredients of an outstanding alpine experience are present: high, jagged, rocky peaks, numerous gorgeous glacial lakes with exceptional fishing, lush meadows and incredible vistas. And yet, despite the superlative attributes claimed by the Grey Rocks, this awesome cluster of peaks is completely off of the radar of hikers and peak baggers. The south summit of the Grey Rocks. I first became aware of the Grey Rocks while going to school in Chico 13 or 14 years ago. I went to the Castle Crags to hike and prior to setting out on the Castle Dome Trail, I walked out to the viewpoint near the trailhead. 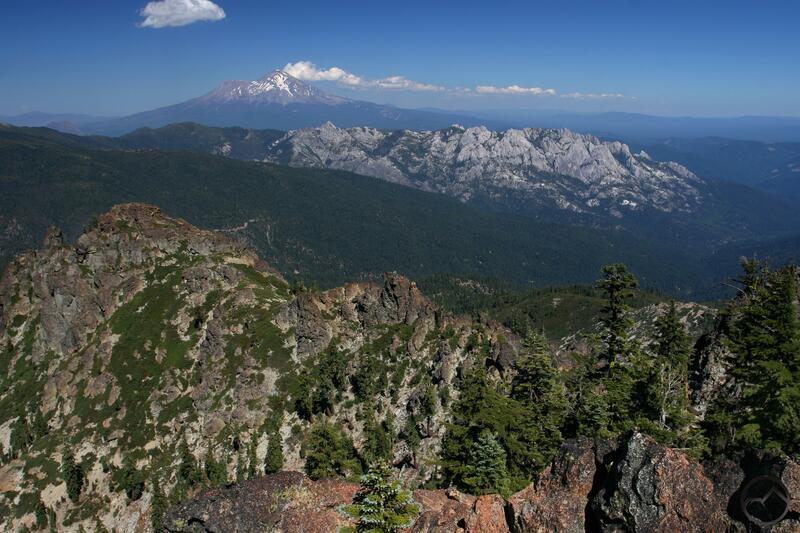 The vista takes in views of Mount Shasta, the Castle Crags and the Grey Rocks. I had noticed the peaks briefly high above I-5 but this was the first time a name had been given to the peaks. Years later, when I returned from my sojourn in Texas, my curiosity about things seldom seen was more developed and engaged. I researched the peaks but nearly nothing was written about these dark, mysterious towers. The most significant entry I found was a reference to climbing the Grey Rocks in a well-known hiking guide covering the entire state of California. 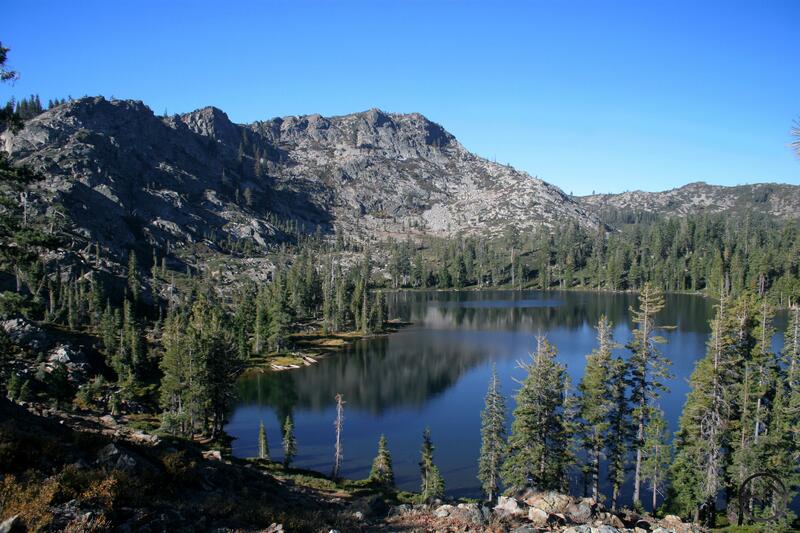 In a poorly written entry on the “Tamarack Lake Trailhead” (which does not, in fact, exist) there is a brief aside about a rugged route departing from the aforementioned lake and leading to the summit. While not commenting on the overall quality of the guide, I can testify that this is erroneous. An ascent of the Grey Rocks from the direction of Tamarack Lake stretches the meaning of the word “rugged”. Such a journey, if undertaken would be long, steep and pass through one of the most hellacious brush-fields imaginable with nothing remotely approaching a trail. Noting the paucity of beta on the Grey Rocks, I resolved to find a route to the summit myself. Grey Rock Lake, Castle Crags and Mount Shasta. Over the next couple of years, I made a few investigative trips around the base of the Grey Rocks, exploring the area and trying to ascertain the best route to the summit. One of the first things I discovered was that there was a trail of sorts, traversing the southern flank of the Grey Rocks. In truth, it was an old and seldom used road that passed an extremely lush meadow and led not to the Grey Rocks but to Grey Rock Lake and a scramble to the top of nearby Flume Creek Ridge. Attempting the summit from this route was completely unrealistic because of the aforementioned epic brushfield. Consequently I shifted attention to the north side of the Grey Rocks. It came as a complete surprise when, while on one of these exploratory trips, I discovered a heretofore unknown lake beneath the rocky north face of the Grey Rocks. It was a moment of great satisfaction. There were no trails, no fire pits, no foot prints and no trash around the lake. I felt as though I was the first person to have discovered this tiny, azure body of water. From the lake I spied what seemed to be the quickest route to the summit. Following this discovery, I returned the next summer and finally reached the top of the mountain that had captured my imagination years earlier. The Grey Rocks consist of two primary towers, northern and southern in orientation. There are a few other subordinate peaks as well. There are two large cirques, one on the north and the other located on the east side of the southern peak. I must confess that it still surprises me that such an awesome set of peaks with such amazing scenic qualities has remained almost completely anonymous for so long. While the peaks themselves are extremely craggy and have a lot of character, they are surrounded by a great deal of exceptional scenery, most notably there is an abundance of lightly traveled or completely untraveled lakes. Bodies of water in an alpine setting always attract hikers and backpackers, so when a collection of lakes like the ones that surround the Grey Rocks escapes the notice of outdoor enthusiasts it comes as a real surprise. The largest and most frequently used lakes (this is relative, since few actually make it to these lakes as it is) are in the Tamarack Lake basin, immediately to the south of the Grey Rocks. The basin also contains the Twin Lakes and a few unnamed ponds. Tamarack, the largest of the three lakes in the basin, is a gorgeous alpine lake backed by a craggy set of gneiss-composed cliffs. Closer to the Grey Rocks is solitary Grey Rock Lake, nestled in a deep bowl between the southern Grey Rocks highpoint and Flume Creek Ridge, which, though separated from the main bulk of the Grey Rocks is part of the peak complex. 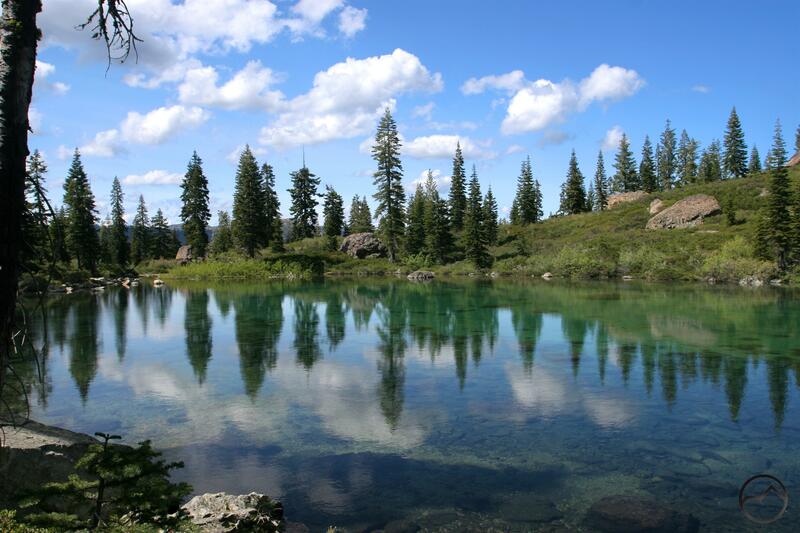 In addition to these large, deep, alpine lakes, there are three unnamed lakes nestled along the flanks of the peaks. The small lake I passed along the route to the summit I named Cerulean Lake, an obvious commentary on the lake’s gorgeous color. In the extremely wild and untraveled cirque on the east side of the peaks are two small tarns tucked into rocky troughs beneath the immense cliffs below the south summit. I named these Whalan and Mears Lakes, after the two named benchmarks on the south peak. This cirque might very well be the wildest place in the Mount Shasta area. Very, very few souls scramble the rocks here. Mount Shasta and the Castle Crags from the summit of the Grey Rocks. In addition to the awesome, rocky peaks and the inviting lakes, the views from the summit are magnificent and include one of the best perspectives on the Castle Crags with mighty Mount Shasta towering high above the granite spires. 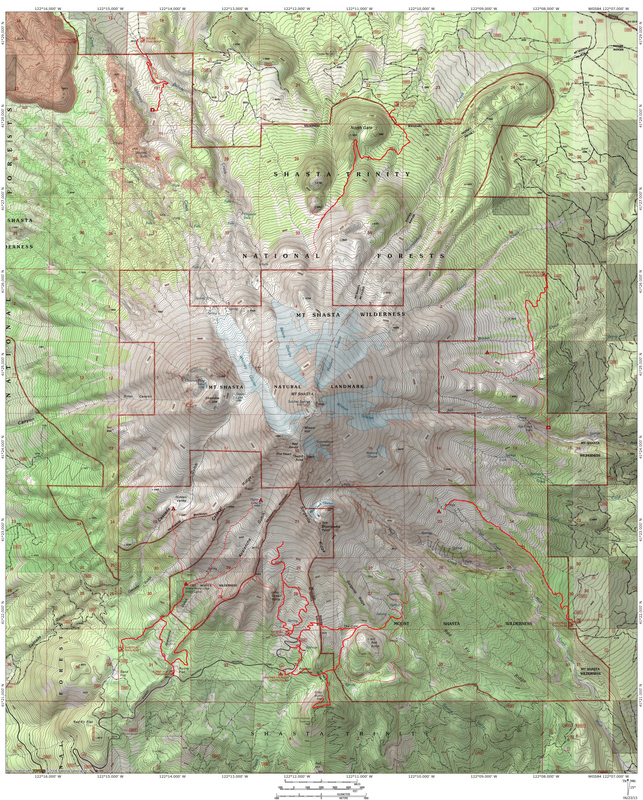 Most of the high mountain ranges of the Northstate, including the Lassen area, the Yolla Bollies, the Trinity Alps, the Marble Mountains, the Siskiyous and the Cascade Crest are all prominently visible from the summit. One can also peer down into the large cirque on the east side of the Grey Rocks and observe Grey Rock Lake and the diminutive Whalan and Meers Lakes. It is a remarkable site and well worth the climb up to the top. Considering the plentiful and fantastic attributes possessed by the Grey Rocks, it is startling how these mountains remain so seldom seen. For those interested enough to venture into their domain, a beautiful and wild setting awaits. For myself, getting to the summit was a deeply meaningful achievement, satisfying my hunger to follow in the footsteps of the mountain men of the 19th century. Not often does one have the opportunity to climb such a significant and attractive mountain and feel as though you were the first person to reach the summit. I am sure that others have climbed the Grey Rocks in the past but any evidence of other visitors is completely absent. In a way, it is comforting to know that such beautiful and wild places are still out there. I do not mean wild simply in that it is undeveloped and nature rules, but wild because it is still a blank spot on the map of the public awareness. isolated basin in the Castle Creek watershed. Winter view of the south summit. Winter view of the north summit. Mount Shasta from the Grey Rocks. Tamarack Lake from the north tower. The Trinity Divide from the summit. 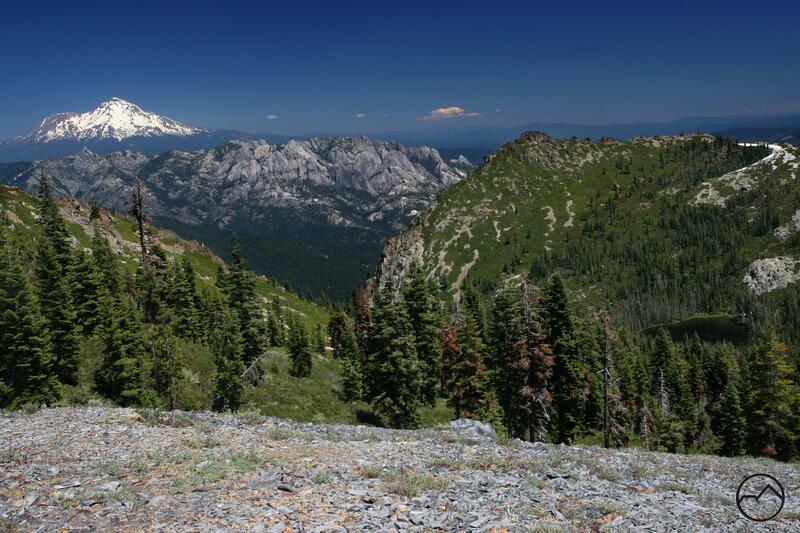 Summit view of Bonanza King and the Trinity Alps. South Summit and Whalan Lake. I need to get out to the Mt. Shasta area for some hiking! Thanks for sharing! My pleasure. I hope you are able to head out this way. Give me a holler if you do! Did you actually make it to the shores of Grey Rocks Lake? I did several years ago. The trail is REALLY faint. Did you start from where the trail is marked on the map? We did not find that trail or any indication at the marked spot. We found several other possibilities as we continued following the road southeast. We tried a few and were able to make some good progress before getting trapped in manzanita. As we exited we found a drainage that seemed more possible with some scampering around the bluff on the east side. We ran out of time and couldn’t explore that option. I can see why this is a rarely visited lake. By the way, we started from the second bridge on the main FS road. No, the map is wrong. I need to up date it. There is a road another 0.5 miles up the really rough road, steep two-track mostly, that leads down to an ephemeral pond. From there there is a single-track trail through the manzanita to the lake. I need to rehike the trail and get good pictures. I usually keep things vague if I don’t have good pictures to back them up. The map is definitely due for an upgrade. I appreciate you helping me refine my posts! Your middle route pretty close. Once you hit the mazanita at the bottom there is a really narrow path that cuts through it, similar to the path from Upper Twin Lake over to Tamarack Lake. It can be tough to find. Thanks, BTW, I think we found your “ephemeral pond” but it was a dry black impression at this time of year. Just a quick note to let you know that Grey Rock Lake and surrounding 800 acres is privately owned (I am the owner). If you are one of those people who treads lightly and would like to go there (with permission), please let me know. My name is Steve Johnson and my email address is johnsonsjames@aol.com. 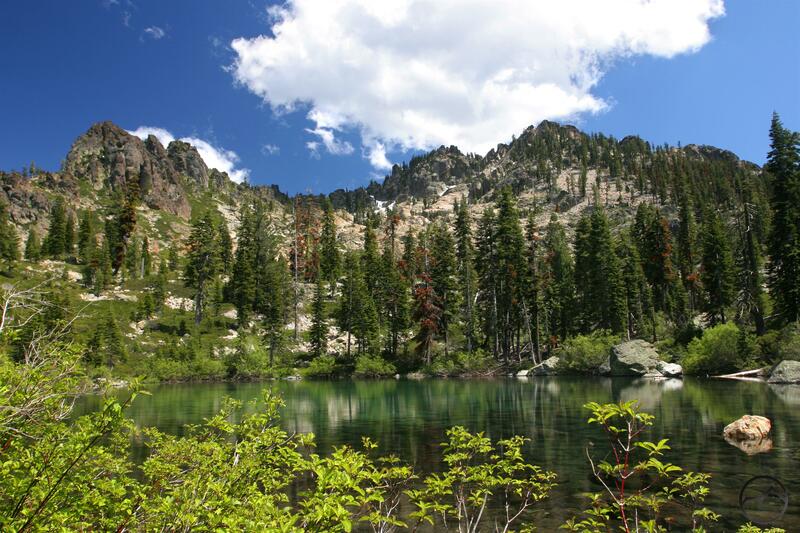 We plan to keep the lake wild and pristine, and are currently beginning a scientlific study of the area’s flora and fauna (as well as geology) with an eye toward wilderness preservation. I would like to make sure that no new campsites or firepits are established around the lake, and there is no trail around the lake (and I would like to keep it that way). I talked to Bubba about this recently, and would not like to widely publish directions on how to get there, or on the best way to get down to the lake. My boys and I have packed out all the trash we could find around the lake, and believe that we are likely the only ones to visit the lake in the last couple of years. The lake is currently very low due to the lack of rain/snow. As noted above, we would like to keep the lake and the grey rocks (I also own the North Grey Rocks) wild and pristine. 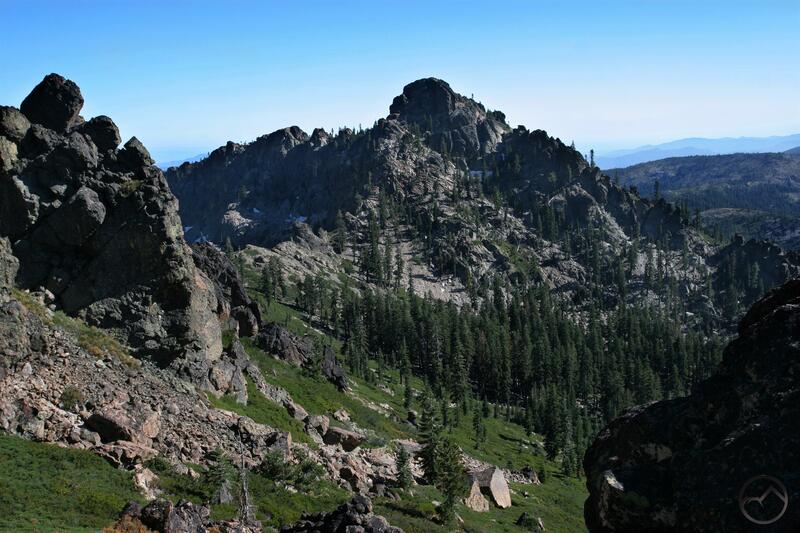 Our long term plan is to work toward establishing a new wilderness area around the Grey Rocks, or maybe connecting the Grey Rocks with the existing Castle Crags wilderness area.